Over the weekend I headed down to a very hot London and although the trip was for the record label I co-own (Reckless Yes) there were so many stories whispering on the sultry air I wanted to note something down about it really quick. Stories seemed written through the city streets, in the fabric of the buildings, and in a literal sense upon the shelves of the library but most people are rushing past without feeling that gossamer thread of words across their face, the cobweb strand of imagination floating forever in the air. 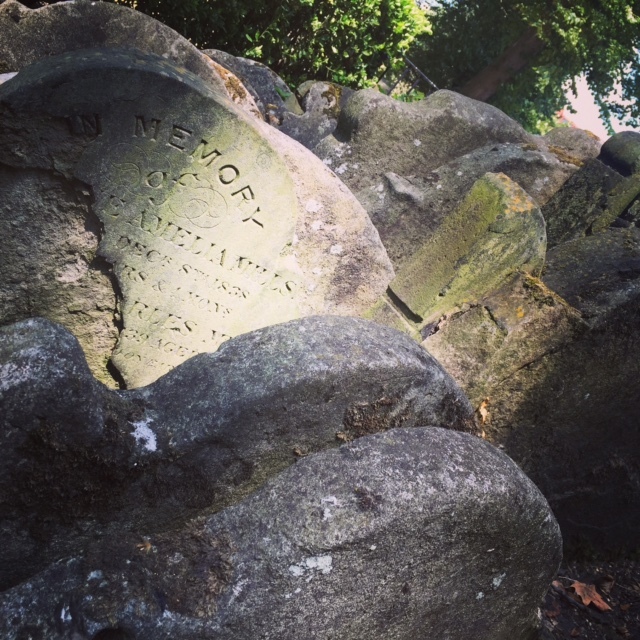 Just around the corner from St Pancras and Kings Cross stations is the quiet and shady haven of St Pancras Old Church. It’s a fascinating building and grounds, whether you are religious or not, and was also a pleasantly calm and cooler escape from the jostling city on a extremely hot day. Among the grave markers and monuments grows an Ash tree. 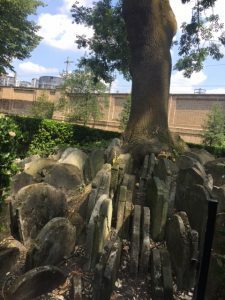 Now circled by railings around its base are circles of headstones, stacked and scale-like as they stand close to their next. The tree is known as the Hardy Tree, after Thomas Hardy – best known as the author of classic Tess of the D’Urbervilles, Jude The Obscure, Far From The Madding Crowd and more – who was one time overseeing the careful removal of graves as the expanding St Pancras cut through what was once part of the churchyard. The tree has grown from the centre of these moved markers, a bend to its trunk as it stretches toward sky, trains squealing past on the rails above. Hardy wrote of how each tree has a voice as well as feature, and I wonder whether this tree would speak for each of the human stories stacked around its base, whether the memories of each life lived – the inscriptions are long rubbed flat to the stone into which they were carved – wind through its roots. “The next morning he boarded the train for the six-hour journey south that would bring him to the strange gothic spires and arches of St. Pancras Station. His mother gave him a small walnut cake that she had made for the journey and a thermos filled with tea; and Richard Mayhew went to London feeling like hell.” Neverwhere, Neil Gaiman. As we shuffled along the packed pavement below St Pancras station, slipping sideways and shoulder-first between strangers, quick-stepping out of the way of the luggage dragged along behind them, I listened to the child unseen behind us talk. 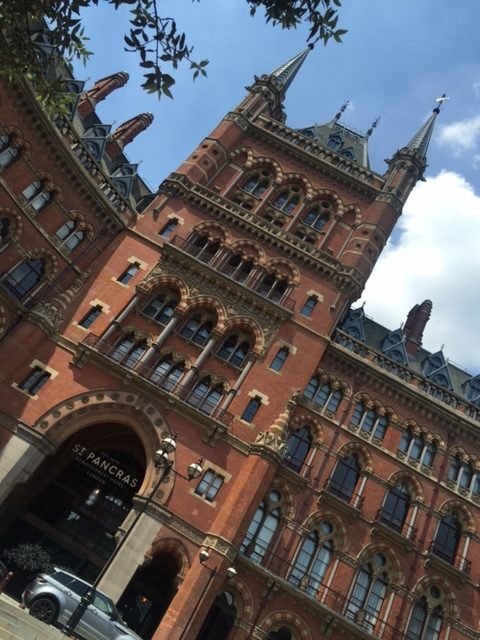 As Platform 9 3/4 sat somewhere at our backs in the noise of Kings Cross, and the grand frontage of St Pancras towered above he said resolute, ‘If Horworts were a city, this would be it. Just get rid of the signs, and the Muggles, and this is just like Hogworts’. There is not much that feels magical about London a lot of the time – it is a rush, and a push, it is hot, and it smells. There is more annoyance floating in the air, than spells. But this is the grown up London seen with grown up eyes, as we rush to another grown up task. The truth is the magic is there, we just become blind to it. The mix of architecture along this street alone – the Victorian gothic, the brutalist, the neo-classic. The idea of transport hubs above and below ground, the sonder of so many people from so many places. The cameraderie spilling from pubs and cafes as people gather for the football, the rainbow flags and glittered skin as others pass through on their way to Pride, the mass of others doing and going who knows where. The child may well have been thinking of the literal connection between London and Harry Potter – the mentions in the story for this area of the city, or its use as a setting in the films – or maybe he was sensing the possibilities on the air which we tend to numb ourselves too when we have somewhere to be, something that must be done. His words got me to look up, and slow further, and they made me smile. 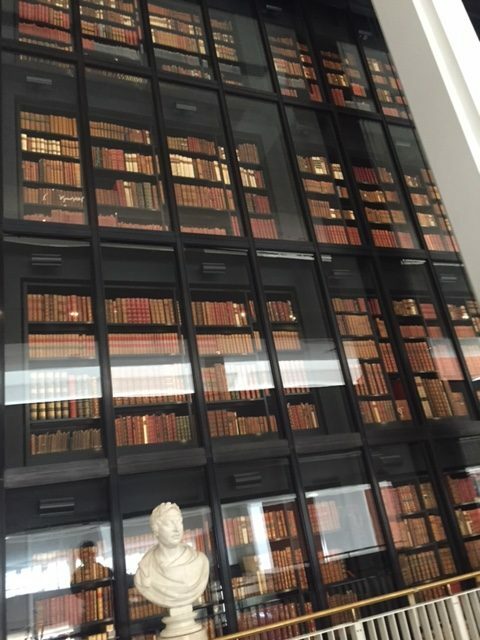 It is almost with shame, dear reader, that I admit I had never been to the British Library until this weekend. I’m not sure how this happened, or rather hadn’t happened, but I’m glad that first visit has now taken place! 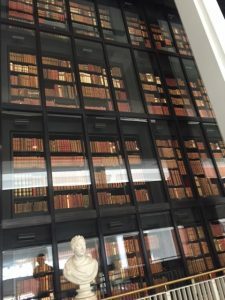 Another calm and cool escape on this hot and busy day – the marble floors and air con was welcome but the impossible height of the open atrium inspired wonder as soon as I stepped through the doors. I am a lover of possibilities and libraries are perfect locations for a person that way inclined – every shelf contains a million possibilities, the pages of the books and the knowledge and the ideas; each book testament to an author’s possibility filled and the possibility of an idea or a fact passed on. This is one of the better parts of humans, and already I long to go back and explore the rooms away from this central social area, to sink into some random find and let it blow a dandelion seed of an idea across the expanse of my mind. The opening of The Winter Passing takes place in a city but it’s never named – in fact none of the locations in the story are explicitly picked out as definite places of real existence. This vagueness is deliberate; I wanted there to be enough that was familiar that you can imagine a geography, and the journey, without locking a reader down to the exact look of streets, of smells, or into their own memories and knowledge of a place. But here I feel I could easily bump into Centaury – she would be hunched but determinedly looking upward at the parts of buildings so many miss, trying to pass unseen and untouched among the many strangers. I could be jostled by Pete as he jogged past, the sharp angles of him. The Professor may be found in the dim light of the side rooms of the British Library, Tilda and Jen tripping through the station arm-in-arm as they head across London to Pride on this day, Rune sat cross-legged among his bags at a table outside a pub as he watches everything go by. The Winter Passing is more pastoral than urban fantasy, the story doesn’t only stick to the city streets, but the city is through all the characters even if it isn’t the backdrop to every scene. The Winter Passing eBook edition is available now. If you have already read the book please remember to leave a review on Amazon or GoodReads.